Generally, volunteering can help the volunteer make important networking contacts and referees, develop skills, enhance a résumé, and build self-confidence. However, not only volunteers claim all the benefits. According to the Volunteer in Nigeria blog, engaging extra hands can help organisations plan and deliver projects and events. Moreover, if Nigeria (and indeed Africa) is teeming with idle youths and the situation poses a social development problem, then productively engaging this set must equal being socially responsible. SMW Lagos: Are you an active volunteer? Femi: Yes! I always look for opportunities to volunteer for any project so long as it adds to me and is of benefit to humanity. I have volunteered for the Women In Media Workshop, the Nigerian Students’ Roundtable, Liveway TV/Radio, SMWLagos, ELCAbuja, Lagos World Record Toothbrushing Challenge to mention a few. SMW Lagos: Why did you volunteer for SMW Lagos? Femi: Initially, when I decided to volunteer for SMWLagos, a number of things were in it for me; first, it was an event of international repute birthing in Africa and indeed Nigeria for the first time. Secondly, it was about Social Media, an area which caught my interest from my university days, even though I didn’t understand what it entailed. It was indeed an opportunity to grow my professional network and improve my CV. 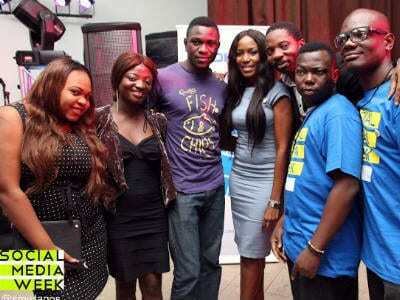 SMW Lagos: How did volunteering at SMW Lagos 2013 benefit your career? Femi: Volunteering at SMW Lagos has benefited my career immensely. First, it changed my perspective about social media thus, re-orienting me. It opened my eyes to the many ways social media impacts society. Second, it led me into starting my blog at www.femibellos.blogspot.com and I have gotten an amazing number of requests to repost. This has given me the opportunity of being a guest blogger with Jobberman and YNaija (I met the Jobberman CEO during SMW Lagos). Did I mention I now have my organization? At SMW Lagos, I was spurred to found my company, CommentHub, a communications and social media servicing firm. Even before establishing my company, I kept getting roles as social media lead for projects and events. It has been an exciting experience, riding on the foundation given me by SMWLagos. Between February 2013 and now, I have had the privilege of speaking at a few events as a social media analyst. In fact, on Monday 6th January, 2014 I was a guest on a Channels TV programme, discussing the impact of social media on the everyday lives of Nigerians. Towards the end of 2013 when the call for volunteers was made, another co-volunteer and I fiddled with the idea of being co-event partners! Inspired by SMWLagos , we are working steadfastly towards a novel concept, #SocialGospelLagos which I believe the world will hear of soon. I could go on and on. I even look forward to pursuing a doctoral degree in the field! SMW Lagos: How can people ensure a volunteering experience is positive? Femi: What you make of it depends on your attitude. If you volunteer for an event having the wrong attitude, you would probably end up struggling for food, transport fare, event shirt or any freebies at the event. You could even be the best behaved and yet leave the experience without an experience! John C. Maxwell says attitude is everything. He further says that it is a difference maker and that is probably what differentiates me from most co-volunteers at SMW Lagos 2013. For more info about volunteering for SMW Lagos 2014 fill out the application here! ChioMa OkeReke leads the Strategy/Communications function at Volunteer in Nigeria. Her interests lie in accelerating development through social impact initiatives that drive youth engagement and helping organisations grow whilst harnessing effective technologies.